With 74 hp, advanced electronics and a state-of-the-art chassis, the 319 pound 701 Supermoto captures the thrill of the race track and brings the pure riding essence of Supermoto to the street. POLYAMIDE REAR SUBFRAME AND TANK: The self-supporting rear subframe with integrated 3.4-gallon fuel tank is perfectly positioned for the best possible weight distribution. Produced in a thermoplastic rotational molding process, the single-piece construction weighs only 5.2 kg and is made of high-strength polyamide. ALUMINIUM SWINGARM: Maximum precision and an extremely low weight of only 8.6 pounds are guaranteed by eliminating welding in the single-component construction of the aluminum gravity die-cast swingarm. WP SUSPENSION (REAR): The completely adjustable rear shock absorber by WP Performance Systems features rebound damping adjustment as well as a high and low compression damping adjustment. The 250 mm rear wheel travel guarantees perfect control in every circumstance, be it on tight and twisty mountain roads or in crowded city centers. WP SUSPENSION (FRONT): The split fork developed by WP Performance Systems has 215 mm wheel travel, and features better damping and an easier setup than traditional forks thanks to the separate damping circuits in the fork legs. The left leg is dedicated to compression damping, while the right fork leg is for rebound damping. WHEELS: Black anodized Giant tubeless spoked wheels are lightweight and strong. 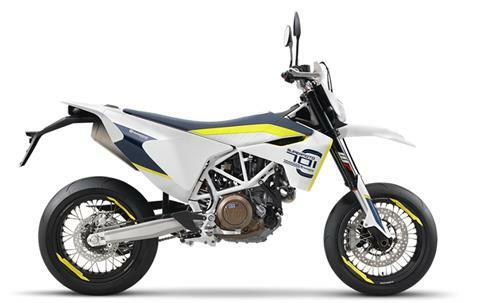 The 17" wheels are shod with Continental ContiAttack Supermoto 120/70 and 160/60 tires front and rear respectively for extraordinarily light handling and exceptional control at all lean angles. BRAKES: Amazing stopping power and control are available at the rider's demand thanks to the radially mounted 4 piston Brembo caliper and floating disc at the front, and the single piston caliper, floating disc at the rear (320 and 240 mm diameters respectively). The latest ABS technology from Bosch guarantees maximum safety and total confidence. SLIPPER CLUTCH: The APTC (Adler Power Torque Clutch) from Adler allows for greater speeds going into and coming out of corners by maximizing rear wheel grip under hard acceleration as well as preventing rear wheel instability and hopping when braking hard into the apex of a turn. The rider thus enjoys maximum control and perfect down-shifting. BODYWORK: Innovative bodywork featuring a long seat that reaches over the radiator shrouds and includes functional ribbing to improve grip in all conditions. Tightly wrapped around the engine and frame, the 701's bodywork is ergonomically designed to connect the rider's body to the bike ensuring perfect harmony between man and machine while allowing for total control in all riding situations. CNC-MACHINED TRIPLE CLAMPS: The anodized CNC-machined triple clamps are designed for high performance Supermoto needs. Stylishly crafted and engineered with a precise flex, they transmit precise information on the behavior of the front end to the rider.